Disclaimer: Pirates for Parties in no way implies to claim any rights or any kind of affiliation with Disney and any trademarked or copyrighted characters including, but not limited to Captain Jack Sparrow, as well as any intellectual property pertaining to the motion picture/s "Pirates of the Caribbean” which are TM and © (or copyright) by Walt Disney, Jerry Bruckheimer and its related entities. This web site and its contents are in no way affiliated with Disney, or authorized or endorsed by Disney Corp, Jerry Bruckheimer Productions, Johnny Depp, or any of their subsidiaries. Pirates for Parties is not affiliated in any way, nor do they by fact or inference imply to hold any rights or authorization, rights of association or sponsorship or endorsement of the use of any copyrights or trademarks as held by any individuals, or companies in association with any offer, including, but not limited to Johnny Depp, Jerry Bruckheimer, Disney and its related entities. The contents of this site are © the site's owners, all rights reserved. 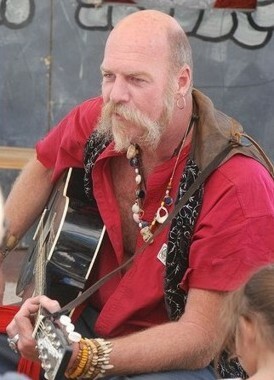 Pirates for Parties provides the best pirate characters in Southern California and all over the United States. Call us for the ultimate pirate party and unforgettable event. One Call gets you the best professional pirate characters for your very special event from our roster of talented professional pirate entertainers for a children's birthday party, adults only pirate party, a company pirate themed party or event or any kind, or any party or event needing the best pirate entertainers in Southern California and the United States. Captain Jack, and Parrot Jack everybody's favorite pirate, is always a hit at every event he appears. All of our Captain Jack pirates are experienced actors and entertainers and will bring the captain alive at your event. Adults and kids of all ages love Jack and interacting with him in pirate party activities. Jack is a perfect choice for a fun children's birthday party or any kind of party or corporate event. Pirates for Parties has ALL the best pirate entertainers in one place for your party or event. Call us to plan and produce your whole party for the ultimate pirate party event. Pirates for Parties provides the finest pirate theme entertainment, or entertainers for your pirate theme party, Pirates or a Caribbean party or Pirate show, children's pirate parties or pirate theme children's birthday party in cities throughout the United States. We provide Pirate Props for rent and pirate theme decorations, and your choice of pirate band for the ultimate pirate theme party. Hire a Pirate Caricature Artist. Call for the ultimate children's pirate birthday party. 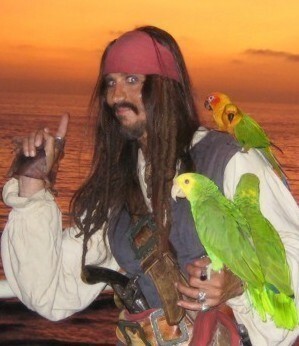 Call us for the best pirate characters for your kids party - Orange County's best pirate entertainer for hire! We are a professional event planner and party planner company and we can provide you entertainment and all the information and ideas to throw the ultimate pirate party for your corporate event, trade show, hotel, resort, company picnic, Theme party, birthday party, adult party, adults only pirate party, graduation party, Quincearas, Sweet 16, Bar Mitzvah, Bat Mitzvah, Purim party, Company picnic, Luau, meeting, anniversary, wedding, pirate theme wedding with a pirate minister, get married by Captain Jack, tropical theme party, Jimmy Buffett Party, Parrot Head Party, Mardi Gras party, Pirate shows, company event, corporate theatre production, or any theme party. Call us about a pirate show for your event. We are the ultimate event planner for a pirate theme event. 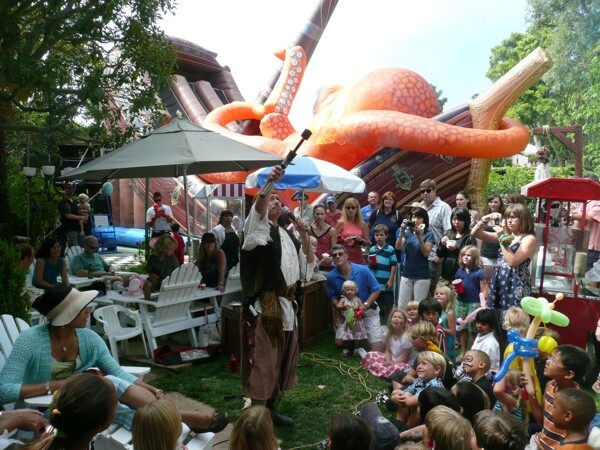 We are experts at producing a pirate festival and provide pirate entertainment to pirate festivals all over the USA. Call us to hire a pirate for a party. We provide entertainers for hire, actors for hire, pirate decorations, party decorations, exotic animals, parrots, a parrot show, parrots for pictures with guests, photo booth with parrots, a baby chimp at your event -- You can hire a mermaid sitting on a boulder for photo ops at your party or event. We design and create Jungle scenes and sets. monkey for hire or monkeys for hire, Cockatoos, palm trees, plants, silk palm trees, tropical vines, lighting, staging, custom props, props for rent or sale, fire breather, sword swallower, knife thrower, Chimpanzees magician, comedian, actors, dancers, DJ, organized treasure hunt, scavenger hunt, team building event, comedy show, pirate show, Australian theme party, Chimp actors Hawaii theme, Tiki theme party, Tiki decorations, Tiki props, parties on the beach, sailing ships, tall ships, yacht charter cruise, cannons for rent, Cannons for sale, pirate actors, Catalina Island party and many other pirate entertainment and pirate party production. We have Princess characters for a princess party. Cinderella, HIRE a Mermaid for your Event Snow White, the little mermaid. Captain Hook in Neverland, Rent a pirate for your event like Jake. Make a chimp video.